First published in 1986. Dubliners was James Joyce’s first major publication. Setting it at the turn of the century, Joyce claims to hold up a ‘nicely polished looking-glass’ to the native Irishman. In Backgrounds for Joyce’s Dubliners, the author examines the national, mythic, religious and legendary details, which Joyce builds up to capture a many-sided performance and timelessness in Irish life. 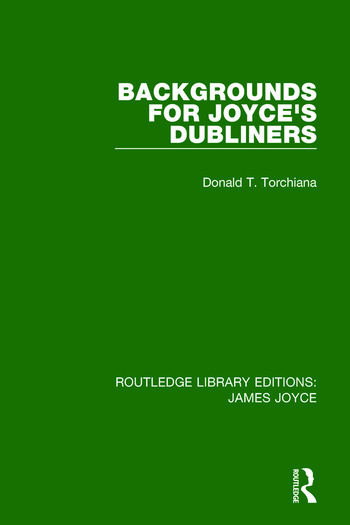 Acknowledging the serious work done on Dubliners as a whole, in this study Professor Torchiana draws upon a wide range of published and unpublished sources to provide a scholarly and satisfying framework for Joyce’s world of the ‘inept and the lower middle class’. He combines an understanding of Joyce’s subtleties with a long-standing personal knowledge of Dublin. This title will make fascinating reading for scholars and students of Joyce’s writing as well as for those interested in early twentieth century Irish social history.